As part of his job, Gary Simons ’74 conducts vitality assessments of every known language. One of his research interests is Austronesian linguistics. For linguist Gary Simons, the shape of his life’s work follows the contours of the world’s 7,105 living languages. The 1974 Seattle Pacific College graduate has, for nearly 40 years, tracked, researched, and documented every known language in support of a global movement of Bible translation and language development that has engaged with about 2,000 distinct cultures since his career began. 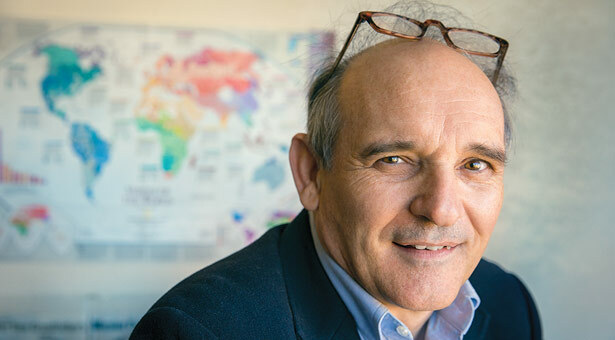 Simons is now chief research officer for SIL International, formerly called the Summer Institute of Linguistics, a nonprofit organization that partners with Wycliffe Bible Translators. In that role, he facilitates projects that help languages become more developed. For instance, a language in vigorous use orally might need written standardization. Simons is also executive editor of SIL’s flagship publication, Ethnologue: Languages of the World, the authoritative and comprehensive online reference catalog of every known language (ethnologue.com). The decision to serve with SIL International came in Simons’ senior year of high school, as he wrestled with the challenge posed by the Preacher in Ecclesiastes: “Why then have I been so very wise?” He specifically chose Seattle Pacific and a self-designed “interlanguage” major that included anthropology and the study of Greek, German, and Latin — plus credit for learning Tok Pisin during a year in Papua New Guinea with his parents, who were serving short term with SIL. He also took the one course Seattle Pacific then offered in computer programming, which led to a campus job handling programming and operations for student registration and grade reports. “It was perfect preparation for a doctorate in linguistics from Cornell University,” he says, “in which I was able to incorporate a minor in computer science.” Early in his career at SIL, he and his wife, Linda, conducted linguistic fieldwork in Papua New Guinea and the Solomon Islands. In Ethnologue, readers learn that English is the most widespread language on earth, well established in 101 countries. They learn, too, that many languages could fall silent in the near future unless the younger generations are taught to speak them by their elders. What often surprises readers most is the large number of distinct languages in the world. Simons says that when typical people are asked how many languages there are, the answers average “about 200” — not even close to Ethnologue’s 7,105 living languages. Two hundred is actually the number of languages that have more than 3 million speakers. At the other extreme, 662 languages have fewer than 100 first-language speakers. “Another surprise to the lay person is where language endangerment is most prevalent,” says Simons. “While language endangerment is uncommon among the 2,146 living languages of Africa, it is quite prevalent in the Americas.” Of the 254 living languages indigenous to the U.S. and Canada, Ethnologue reports, 151 are dying and 85 are in trouble.